Love cheesy seafood dishes? 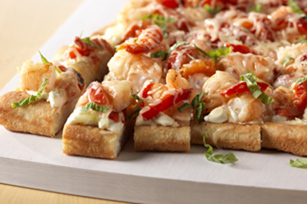 Love shrimp pizza? You'll love these Shrimp Pizza Squares made with cream cheese, mozzarella and Parmesan that serve 36 people. Unroll pizza dough onto baking sheet sprayed lightly with cooking spray; press into 13x9-inch rectangle. Bake 12 to 15 min. or until lightly browned. Meanwhile, cook shrimp and garlic in dressing in large skillet on medium-high heat 3 to 5 min. or until shrimp turn pink, stirring frequently. Remove from heat; drain. Spread cream cheese onto pizza crust, leaving 1/4-inch border around sides. Top with shrimp, shredded cheese and peppers. Bake 10 min. or until shredded cheese is melted. Sprinkle with basil. For variety, top pizza with sliced fresh mushrooms and/or chopped drained marinated artichoke hearts instead of the roasted peppers. Sprinkle pizza with 1/2 tsp. crushed red pepper, or more to taste, before baking as directed.